Recently, Russian Science Citation Index formed the list of Impact Factors – 2013 of Russian scientific journals. 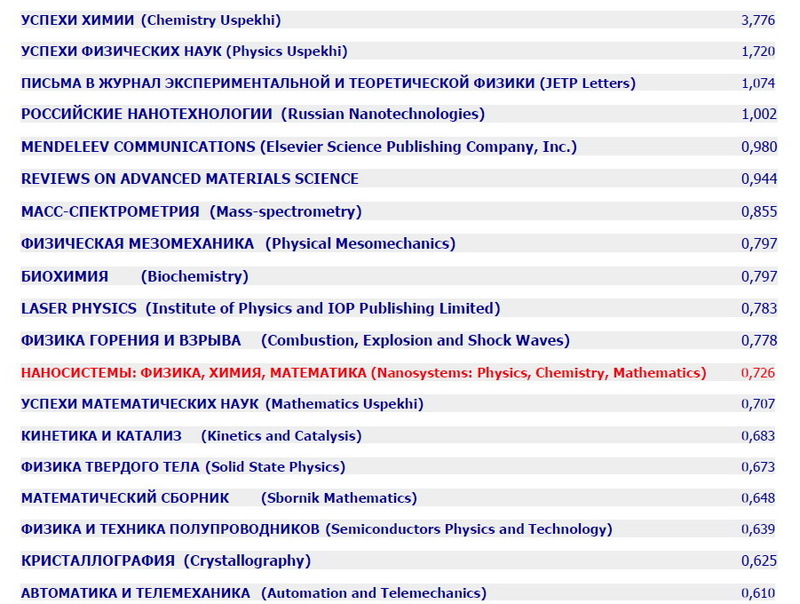 I am glad to inform you that our journal “Nanosystems: Physics, Chemistry, Mathematics” takes the 12th place among ALL Russian scientific journals in the field of Mathematics, Physics and Chemistry! Particularly, in Mathematics – 1st place, in Chemistry – 6th place, in Physics – 9th place. Russian Impact Factor of our journal is now equal to 0.726. See the attached list of Russian Journals Impact Factors. We came to this success due to your participation and your remarkable papers published in our journal! We are glad to consider new papers with your results.